When first researching non-surgical facial rejuvenation, many patients believe they should choose one type of cosmetic injectable that best suits their area of concern. In most cases, however, patients experience a variety of bothersome issues that may require two or three different kinds of products to achieve the desired results. At our practice, Dr. Eugenie Brunner creates custom treatment plans designed to provide an exceptional outcome tailored to the unique requirements of each individual. There is an impressive assortment of cosmetic injectables available, each with innovative compositions and increasingly long-lasting benefits. They include dermal fillers, such as Radiesse®, JUVÉDERM VOLUMA™ XC, Restylane®, and Belotero Balance®, neurotoxins like BOTOX® Cosmetic and Dysport®, and collagen stimulators like Sculptra® Aesthetic, a collagen stimulator. 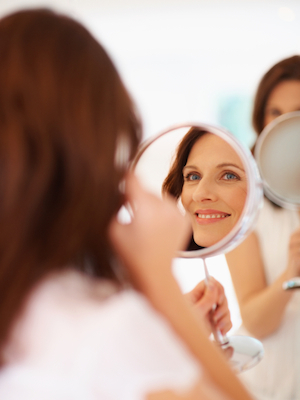 By selecting the appropriate formula based on the singular needs of each patient, Dr. Brunner can typically provide comprehensive aesthetic enhancement that can potentially address all common signs of aging, from mild and moderate creases to volume loss. By examining the patient prior to the procedure and developing a conservative plan, Dr. Brunner can also avoid over or under-correcting, leading to more natural-looking results. In addition to often recommending a series of treatments to gradually produce the desired outcome, she also employs her background in art to apply cosmetic injectables in small amounts at different depths, much like a restoration expert delicately renewing the beauty of a painting. The diversity of consistencies allows her to layer the dermal fillers for a dramatic yet undetectable effect. Dr. Brunner also stresses that the key to long term results is repeat “touch-up” injections, of any of these fillers, at six to twelve month intervals. By “touching up” your results in this time frame, before your results dissipate, new collagen formation is stimulated and your results last for long periods of time. While some injectors may have a set series of products and locations they use in a “liquid facelift,” Dr. Brunner utilizes a full range of FDA-approved cosmetic injectables, selecting only the brands and volumes appropriate for the individual. A thorough discussion to determine the patient’s aesthetic goals is an essential part of every initial consultation. For more information about customized cosmetic injectable treatments, or if you wish to schedule a consultation with Dr. Brunner, please contact our office today.